Okay, okay, it’s only March, technically just barely spring. 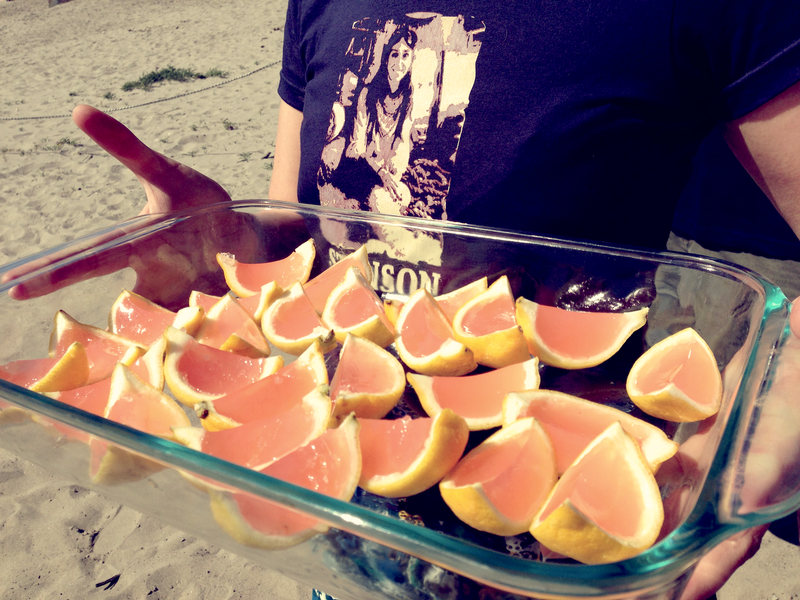 But oh if it isn’t one of those special times of year when sun-shiny lemons are still in season, birthday celebrations are moving outdoors, and the weather in the Bay Area is unexpectedly cooperative. 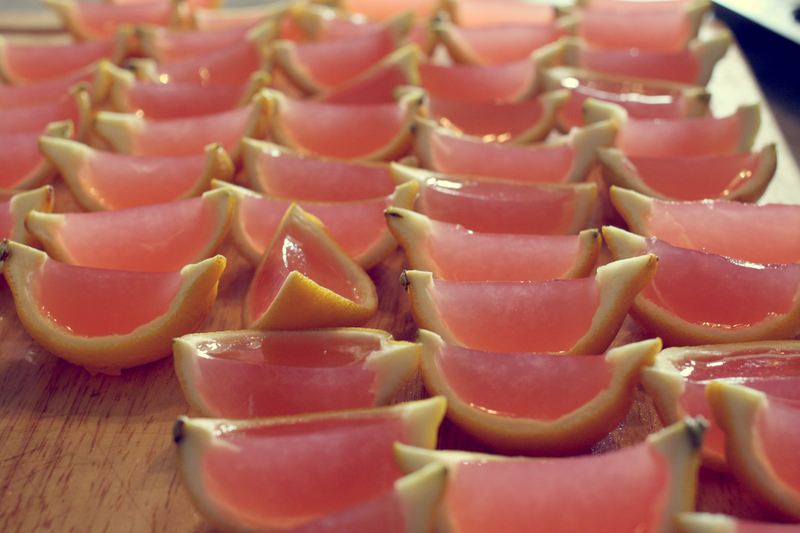 The obvious way to celebrate these small victories: Fancypants Jello shots! These have been all over Pinterest lately, but the recipes vary wildly, frequently discard the delicious lemon innards, are mostly vague in general. 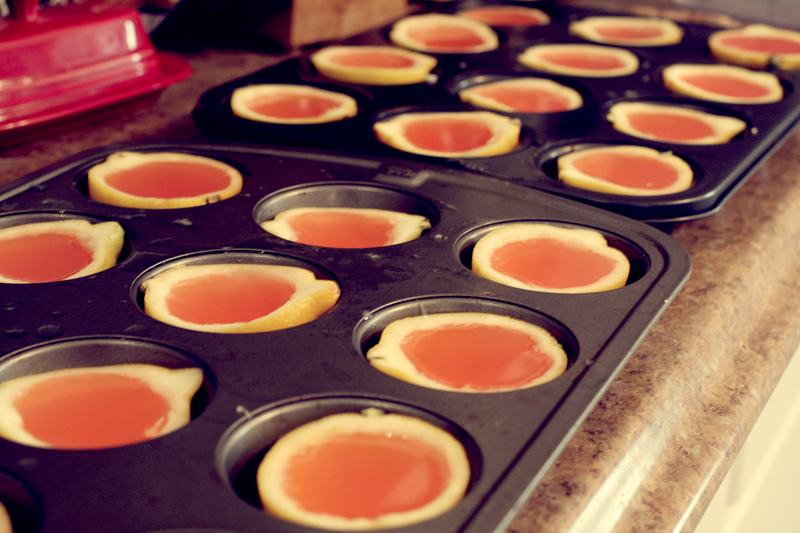 Some even dispense with the lemon idea and go with watermelon-flavored Jello in order to achieve the appropriate color, to the detriment of the served-in-a-lemon cleverness. Heresy! Now I’m not above a processed box good in the name of good campy fun (see: Mom’s marshmallow fluff fudge) but the shops near me simply don’t carry Jell-O brand jello. I know, I know, sad foodie problem. So I adapted the recipe to use gelatin and pure lemon juice, so this is a nearly-no-waste recipe with all-natural ingredients, save for the two drops of red food dye that give them that approachable hue. 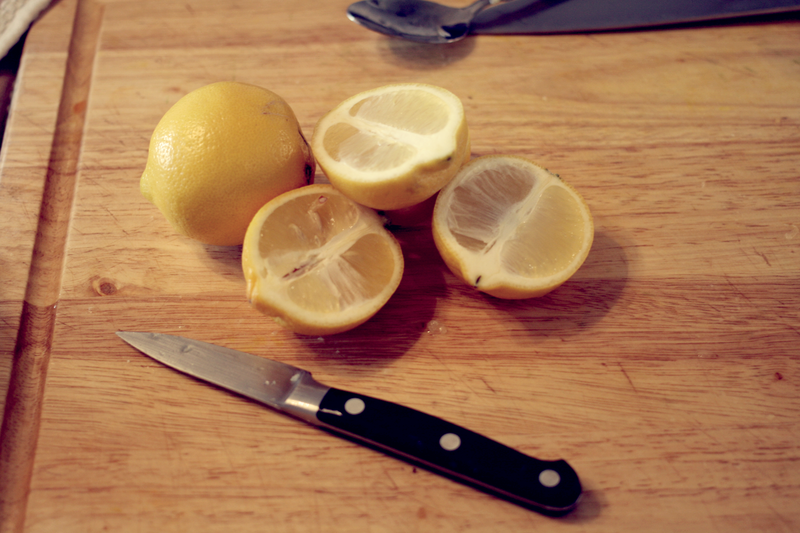 Start by chopping the lemons in half lengthwise. Not in quarters! Just in half. You’ll see… You’ll need about a dozen lemons to get 48 shots – but don’t kid yourself, no one’s having just one! Cut a lot while your hands are clean, because the next part gets kind of sticky. Next is the most laborious part: hollowing out your rinds. But it’s not really that bad, once you get the hang of it. Just slide your paring knife around the outside edge of the lemon, between the white pith and the juicy flesh. You don’t need to go all that deep, just all the way around far enough down to let you get your fingers under the segments. Go all the way around each half of the fruit, then reach in and loosen from inside out, slowly separating the still-connected segments from the pith; it will kind of feel like peeling an orange in reverse. 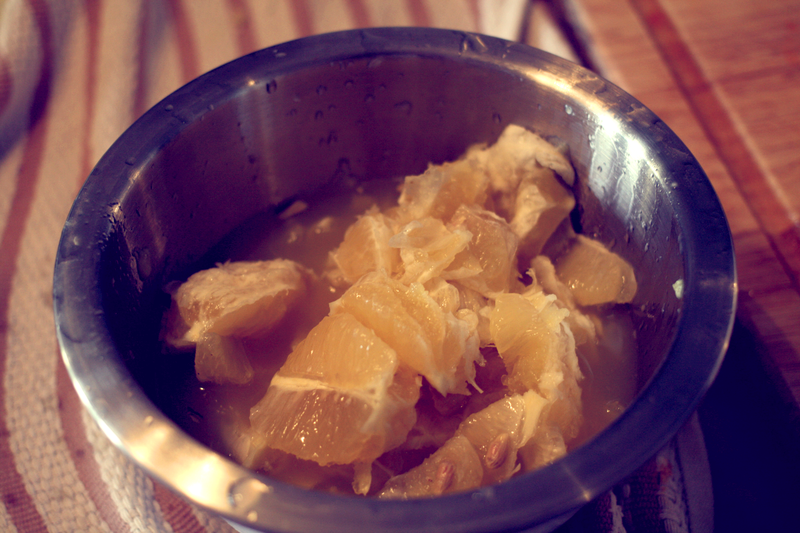 Take care not to tear the rind, but you can squash the segments all you want – just do it over a bowl to catch all the juice. Ok, now you’ve got your rinds, get them staged to receive their liquid destiny. Lemons are notoriously rolly-polly, so the best way to get them to behave is to drop each half in a muffin tin indentation. Get them as level as possible but don’t stress too much. 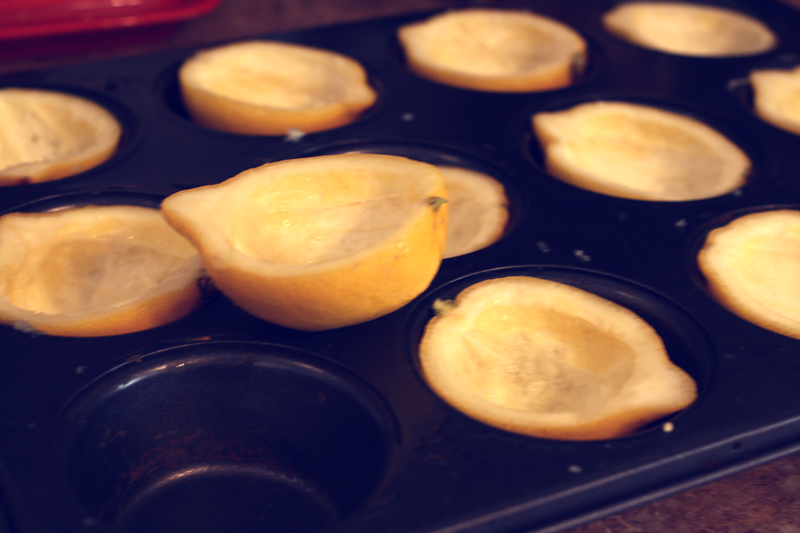 12 lemons = 24 halves = 2 regular muffin tins. Perfect! Next is where we go off-road with the recipe by making our own lemon flavoring via homemade lemonade. Keep in mind we’re going to add some vodka to the mix so the filling going to be diluted a bit and a little bitter. To counteract that, rather than use bottled lemonade or a standby summer-day recipe that balances sourness with water, we’re going to go with concentrated lemonade – basically just lemon juice with a whole lot of sugar added. Do not be afraid. It is necessary and delicious. The basic gelatin ratio is 1 packet to 1 cup of liquid. It will take about 4 cups of liquid to fill all 24 lemon halves, although that’s an estimate depending on the size of the fruit. You can vary the amount of vodka, but I landed on 1.5 cups vodka to 2.5 cups of juice, so 4 packets. Gelatin packets usually suggest adding the powder to chilled liquid, so measure out your vodka and stick it in the fridge for a bit. Then squeeze all the lemons using your hands in the bowl, and strain the juice into a measuring cup until you have about 2.5 cups, or a little more. If you’re short you can add a touch of water to even up. Heat the juice on the stove, adding about a cup of sugar. Do a taste-test, remembering this is going to be outrageously concentrated, and add more sugar as you wish, until it’s not quite so puckery. In the meantime, pour the cold vodka into a big bowl, sprinkle on all four gelatin packets, let it sit for a minute, then stir it in. Once the juice reaches a boil, turn off the heat and add it to the vodka/gelatin mixture, stirring well. Taste it. It’s probably gonna taste yucky! But try to see through the warm vodka bitter taste, and maybe add more sugar if you deem it necessary. Probably in this case, too much is better than not enough. A typical lemonade is 1 cup lemon juice : 1 cup water : 1 cup sugar so don’t short-change yourself. Use a few drops of red food coloring to turn the mix a lovely coral pink, then pour the mixture into the lemon halves, filling all the way to the tippy top of each (they’ll shrink a bit in the gelling). A spouted measuring cup to make this easier, although a few spills aren’t so bad since the spills will harden and keep the halves upright. If your vodka’s not cold already, stick it in the freezer. Slice lemons in half lengthwise. Use a paring knife to loosen the fruit membranes from the rind, about a half an inch deep all the way around each. Over a wide, deep bowl, reach your fingers into the slit and gently lift the fruit away from the rind, kind of like peeling an orange, taking special care to keep the rind’s shape. It’s ok to squish the lemon insides in the process. Sit the hollowed-out rind upright in a muffin tin, deposit the lemon insides in the bowl with the juice, and continue with the rest until all 24 halves are hollowed-out. Transfer the gel mixture to a spouted measuring cup, working in batches. Check that your lemon halves are level, and fill each to the very top. Carefully transfer tins to the refrigerator and refrigerate until firm, about 3 hours. To serve cut in half lengthwise again, creating wedges.